BeeBop and I recently did something we very rarely do. We took a long weekend trip for just the two of us. It’s very rare that we go away without taking our grandchildren, but they were busy and we had a free weekend, so we took advantage of the time to visit America’s Historic Triangle. When we were deciding where to go, we realized that neither of us had ever been to Williamsburg, Virginia, and its surrounding area and this seemed like the perfect time. We booked a flight so no one would have to drive for hours on end, packed our bags, and off we went. 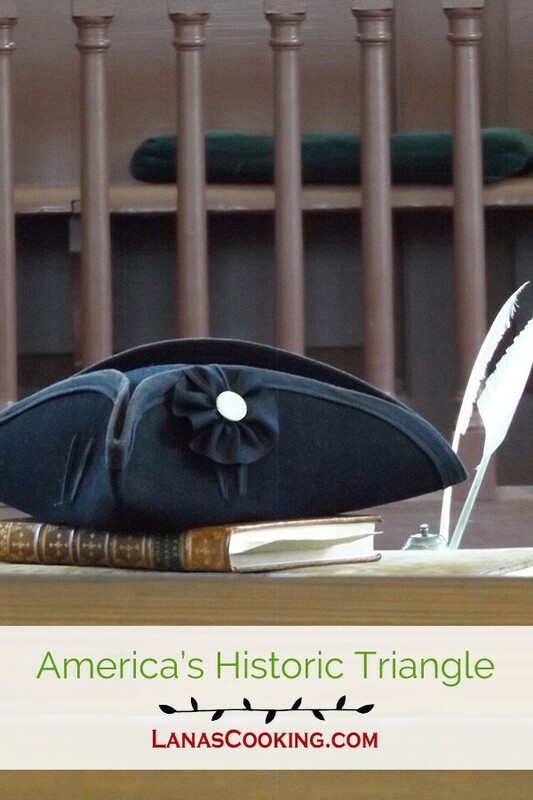 Now, just in case you’re wondering, America’s Historic Triangle includes some of the most historically significant sites associated with the founding of the United States, including Jamestown, Colonial Williamsburg, and Yorktown Battlefield. It’s kind of amazing to think about these three sites being so close together yet their history spread out over different eras. Jamestown (pre-colonial) is the earliest of the sites, followed by Williamsburg (colonial), and then Yorktown (revolutionary). We even worked in enough time to make the trek over to Monticello to see the famed home and gardens of Thomas Jefferson. 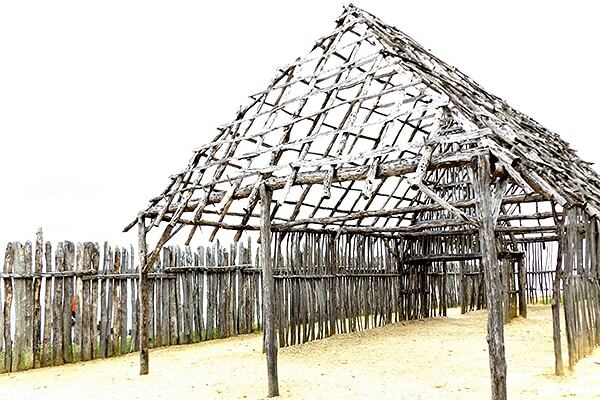 Jamestown is the site of the first permanent English settlement in the Americas. On May 14, 1607, 13 years before the much touted landing at Plymouth Rock, 104 men and boys along with 39 crew members from the Virginia Company landed on Jamestown Island. The first women settlers arrived the following year. Reconstructed barracks and palisade wall at Jamestown. The men and boys spent their first few weeks constructing a wooden palisade fort in a secure place where Spanish ships could not fire into it. The settlement inside this fort was where the seed was planted for the future United States of America. The story of these first colonists is a dramatic one and goes far deeper than the much romanticized and grossly inaccurate story of Captain John Smith and Pocahontas. Disease, famine, and sporadic attacks from Powhatan Indians took a tremendous toll on the population of James Fort, but trade with the Powhatan also revived the colony with food in exchange for beads, copper, and iron tools. 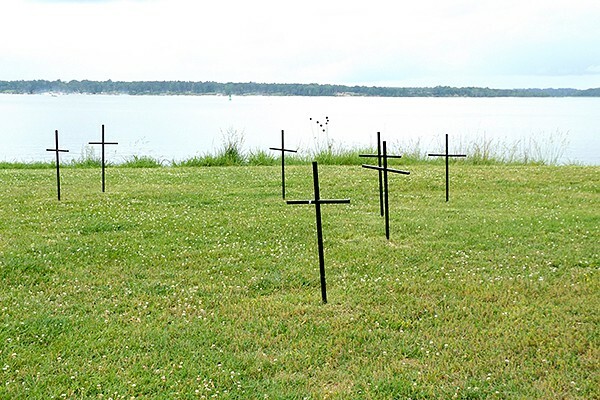 Crosses mark burial sites of some of the hundreds who died at Jamestown. Jamestown’s darkest hour was the “starving time” during the winter of 1609-10. About 300 settlers crowded into James Fort when the Indians set up a siege, and only 60 survived until spring. Years of peace and prosperity followed until a surprise attack in 1622 that killed a third of the colonists. At the site today, you can learn from experts who are continually discovering details about the Jamestown story with their archaeological research. Inside the visitor center you can view an orientation film and exhibit galleries highlighting the history of Jamestown Island from prehistoric times to the present. More than 1,000 artifacts of the nearly 2 million discovered are on display. At the Voorhees Archaerium, located inside the grounds, more than 4,000 artifacts (including 48,000 Native pottery shards found throughout the fort site) are displayed surrounded by the historic landscape of the settlement. The archaearium exhibits focus on the 1607-1624 Virginia Company period at Jamestown. The stories of the settlers’ lives are told through their arms and armor, tools, coins, trade goods, personal items, religious objects, and food remains. Facial reconstruction of “Jane. Part of the Jane’s Story display in the Voorhees Archaearium, Jamestown. A special room in the archaearium discusses death in the early years of the colony. “Jane’s Story” illustrates a pivotal moment during the starving time when the colony nearly collapsed because of drought, disease, starvation, and Indian attacks. Jane was a 14-year-old victim of cannibalism during the starving time. 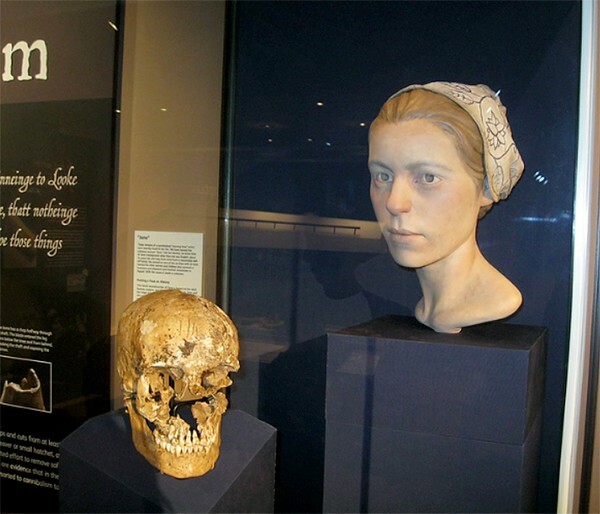 Along with Jane’s facial reconstruction, the room features artifacts from the period. With careful reconstructions, visitors literally come face-to-face with human stories from the beginnings of America. 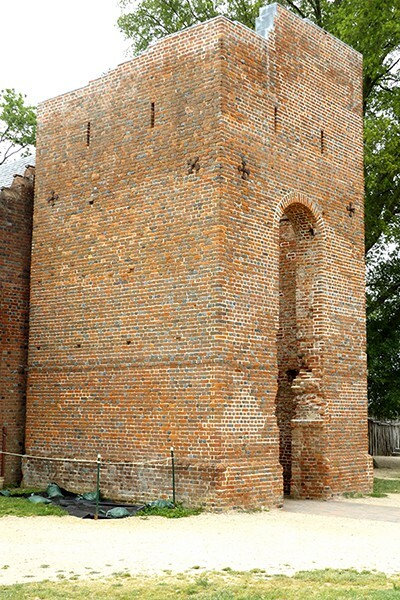 Jamestown Church is one of the oldest surviving buildings built by Europeans in the original thirteen colonies It is part of Jamestown National Historic Site and is owned by Preservation Virginia. The first church on the site was constructed in 1617. It was in this church where the first Representative Legislative Assembly met on July 30, 1619. Construction on the current church tower began in 1639 and took 4 years to complete. The rest of the original church was destroyed after being abandoned in 1750 when a new church was built nearby. The Jamestown site was, quite honestly, my favorite part of our trip. Seeing the archaeological excavations underway and standing on the very ground where the first settlers stood was very moving. I can only imagine what it must have been like for them. They had no one but themselves to depend on. They left their families and friends behind in England with virtually no hope of ever seeing them again. They boarded a ship and came to a wild, unsettled land that they knew nothing about. I’m not sure I would have had the courage to do that. 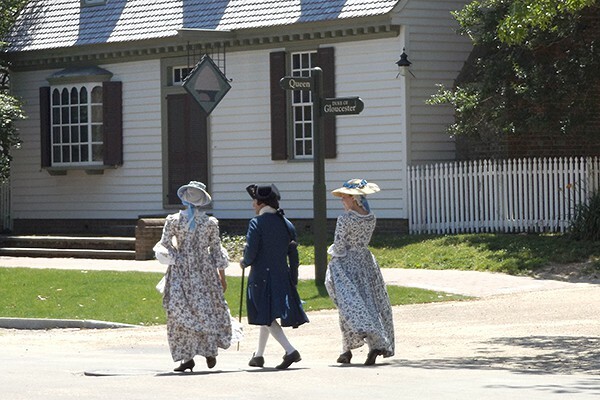 Williamsburg was the capital of Virginia from 1699 to 1780 when thoughts of American independence were taking shape. During this time, it was the political, cultural, and educational center of the largest, most populous, and most influential of the colonies. It was here that the fundamental concepts of our republic were nurtured under the leadership of patriots such as George Washington, Thomas Jefferson, and George Mason. Near the end of the Revolutionary War , the capital was moved to Richmond. For nearly 150 years afterward, Williamsburg was a simple, quiet college town, home of the College of William and Mary. Williamsburg citizens in period costume. In Colonial Williamsburg’s 301-acre historic area are hundreds of restored, reconstructed, and historically furnished buildings. The area includes approximately 85 percent of the 18th-century town’s original area. 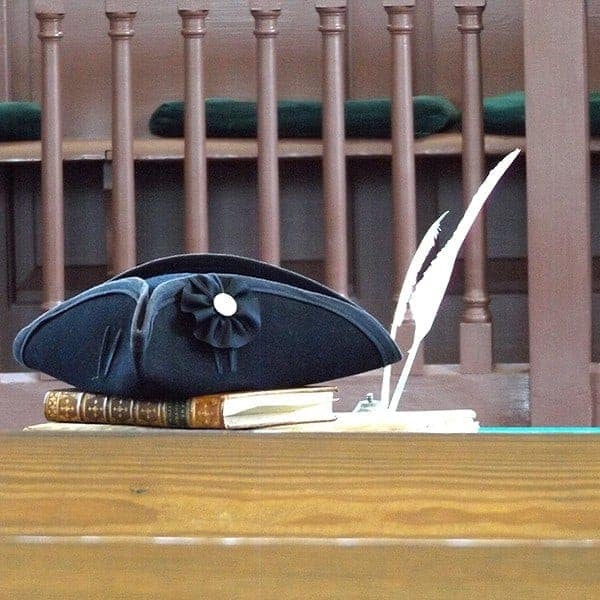 Costumed interpreters tell the stories of the men and women of the 18th-century city—black, white, and native American, slave, indentured, and free—and the challenges they faced. One of the largest history projects in the nation, Williamsburg is part of the Historic Triangle of Virginia. 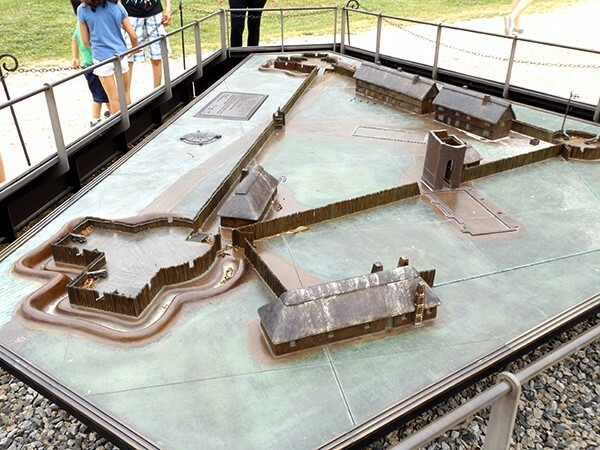 Prominent buildings include the Raleigh Tavern, the Capitol, the Governor’s Palace (all reconstructed), as well as the Courthouse, the George Wythe House, the Peyton Randolph House, the Magazine, and independently owned and functioning Bruton Parish Church (all originals). The Magazine is the first building we encountered as we entered Williamsburg. The Magazine was where the ammunition and gun powder were stored. Just next door to the Magazine was the Armory. This was really one of the most fascinating displays we saw. There were literally hundreds, if not thousands, of period weapons of all kinds. 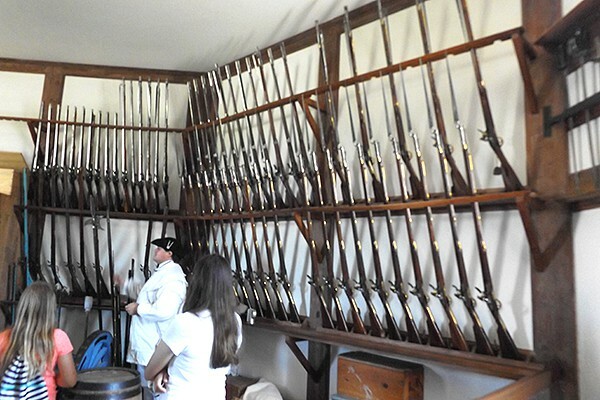 An extra bonus was that the interpreter in the Armory was extremely knowledgeable about the individual weapons, how they were used in battle, and details of colonial warfare. 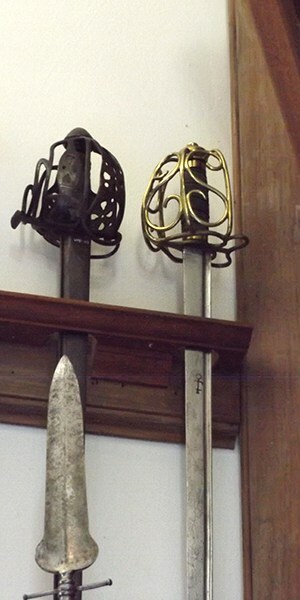 They even had an authentic Scottish broadsword (sword on the left, above). You know I had to have photos of that, Outlander fan that I am! I really wanted to pick up that broadsword, but that would have been frowned upon. 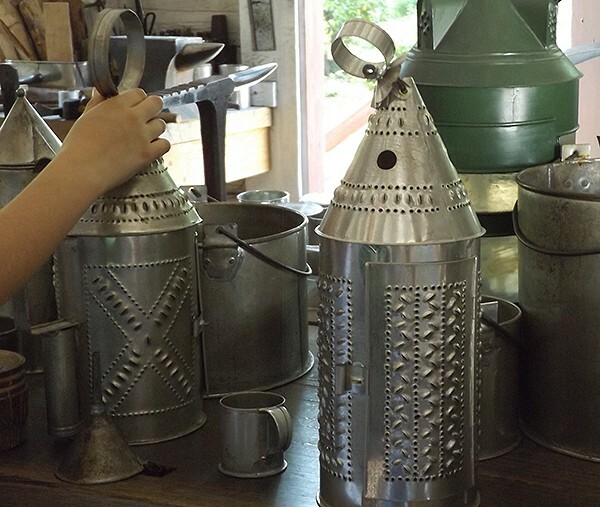 From the Armory, we wandered over to the blacksmith, tinsmith, and then the silversmith. It’s truly amazing how much the interpreters in each location know about the crafts they work with. They’re quite literally artists in their own right and know amazing details about the historic accuracy of the professions they represent. 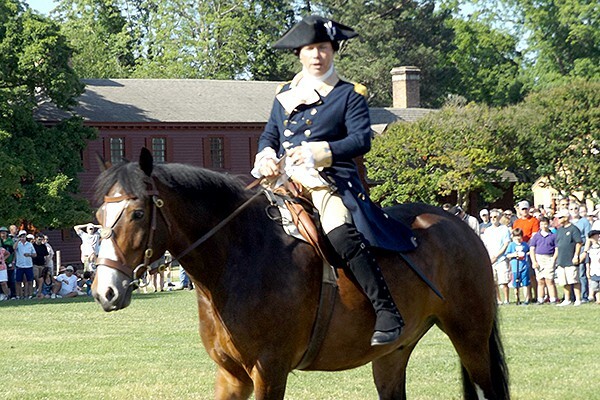 Near the end of the day, we gathered with many others at the parade ground to hear “General Washington” review the troops and address the crowd. However, instead of Washington, it was General Anthony “Mad Anthony” Wayne who appeared. He gave a rousing speech urging the troops on to Yorktown and victory. 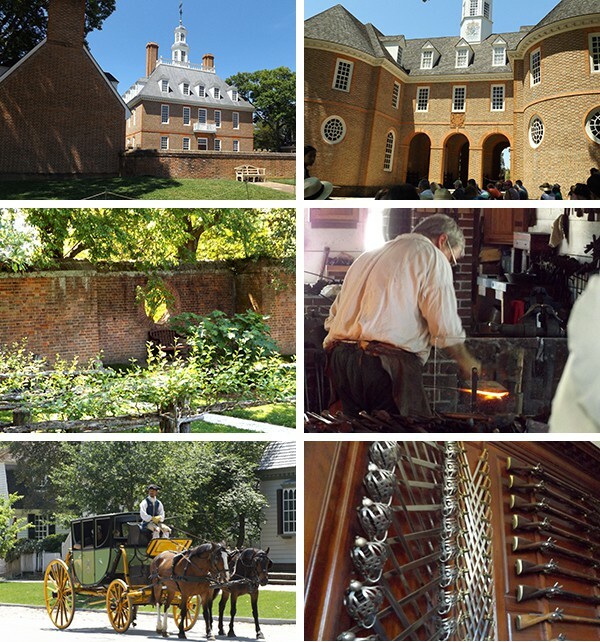 A few of the sights around Williamsburg – the Governor’s Palace, the Capitol building, gardens, a blacksmith at work, horse-drawn carriages, and a display of period arms. There is so much to see at Williamsburg that it would require several blog posts to cover it all. Some of the highlights of our trip were visiting the Governor’s Palace, the Capitol building, the printing office, the blacksmith, and silversmith. If you’re a student of history, I’d suggest a full two-day visit, at a minimum, to really see everything Williamsburg has to offer. Of all the places we visited throughout our trip to the Historic Triangle, I have to say that Williamsburg was the most commercialized. I think I was expecting more realistic portrayals from the “citizens,” and although they were dressed in period costume, most of them spoke in a contemporary manner which, for me, spoiled the effect. Also, I particularly grew weary of being asked at every opportunity to support Colonial Williamsburg with a donation. In the fall of 1781, a combined American force of Colonial and French troops laid seige to the British Army at Yorktown, Virginia. Led by George Washington and French General Comte de Rochambeau, they began their final attack on October 14, capturing two British defenses and leading to the surrender, just days later, of British General Lord Corwallis and nearly 9,000 troops. Yorktown was the final battle of the American Revolution, and the British began peace negotiations shortly after the American victory. Yorktown’s historic earthworks are remaining tangible evidence of one of the most significant events in American history. Their continued preservation is one of the great challenges facing the National Park Service. Yorktown National Cemetery is a civil war burial ground adjacent to the spot on the 1781 battlefield where the British surrendered to General Washington. There are 1,596 marked graves in the cemetery. Of the total of 2,204 burials, 747 are of known persons and 1,436 unknown. Those buried here were for the most part Union Army soldiers, although 10 Confederate soldiers and three wives are also identified. 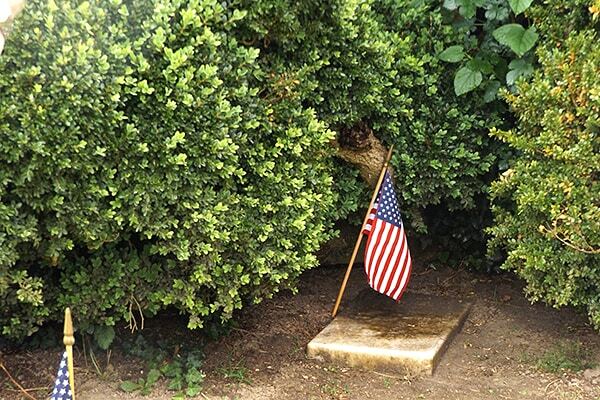 Each grave, no matter how overgrown with shrubbery or trees, was recognized for Memorial Day. Even though it was raining the day we visited Yorktown, we walked the grounds for probably 20 minutes, both of us a bit lost in thought. I’m not sure we even spoke to each other while we were there – it was a place that called for respect and reverence. 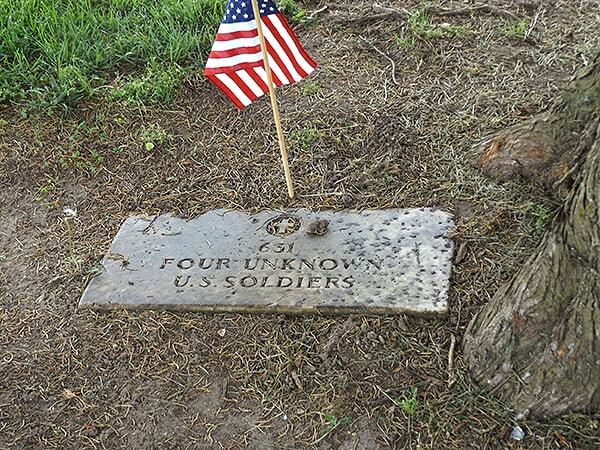 One of the many burial sites of unknown soldiers at Yorktown. I kept thinking about all those unidentified men who lay in that hallowed ground. They left their homes to fight for something they believed in and never returned. Their families never knew what happened to them, and they were never recognized for their efforts. It’s quite humbling to stand in the presence of their spirits. Monticello was the primary home of Thomas Jefferson, who began designing and building Monticello at age 26 after inheriting the land from his father. Jefferson designed the house and oversaw all aspects of its construction himself. It is built in the neoclassical style and includes many of his own innovations. A panoramic view of the Monticello garden. Situated on an 850-foot high peak, the name Monticello means “little mount” in Italian. The property had numerous outbuildings including a nailery, quarters for domestic slaves, kitchens, gardens for flowers and produce, along with fields for tobacco and mixed crops. Jefferson’s burial place on the grounds of Monticello. 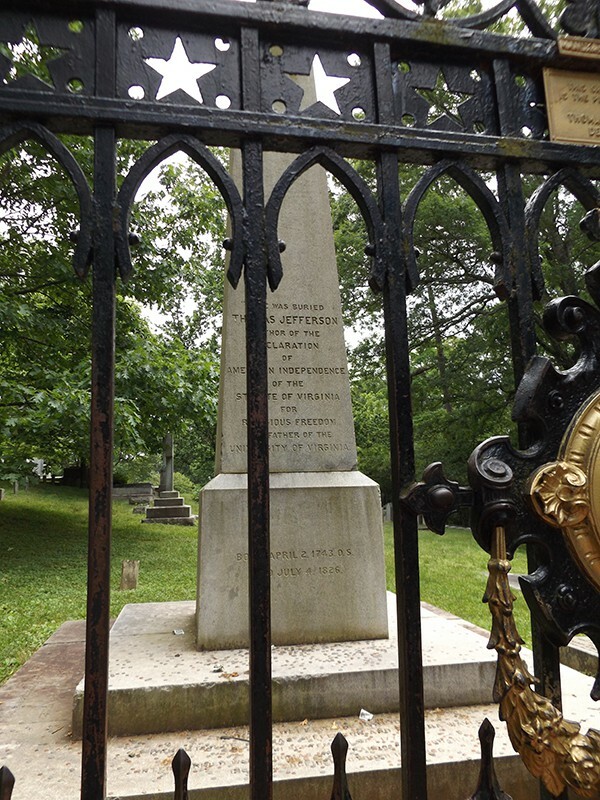 Jefferson directed that he be buried on the grounds in an area which is now designated as the Monticello Cemetery. 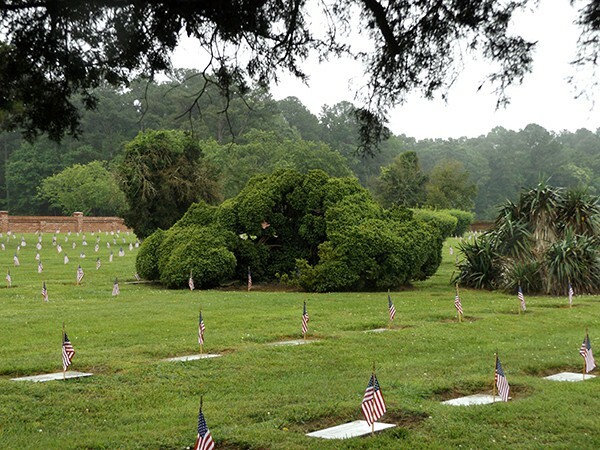 The cemetery is owned by the Monticello Association, a society of his descendants through Martha Wayles Skelton Jefferson. 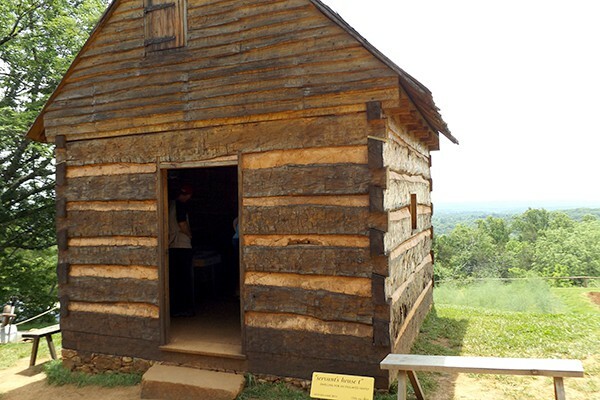 The Hemmings’ cabin at Monticello. The Thomas Jefferson Foundation (TJF) operates the property as a house museum and educational institution. 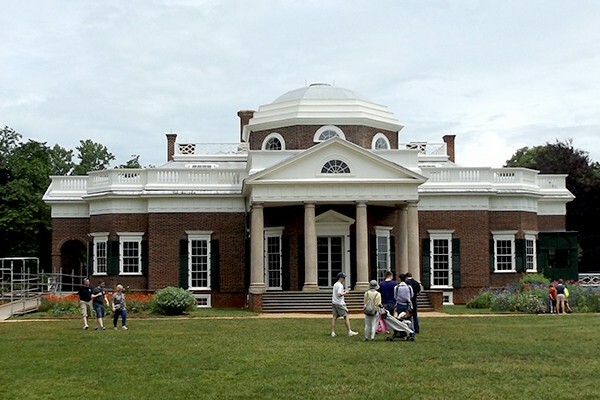 Monticello and the nearby University of Virginia, also designed by Jefferson, were together designated a UNESCO World Heritage Site. I would have liked to spend much more time at Monticello, but we had to get to the airport for our flight home. Although the house tour itself was quite brief with no photography allowed, there were so many interesting things to see throughout the grounds and gardens. If you go, do allow yourself plenty of time to just stroll around. To wrap up this post, I want to add a message just for my fellow bloggers. 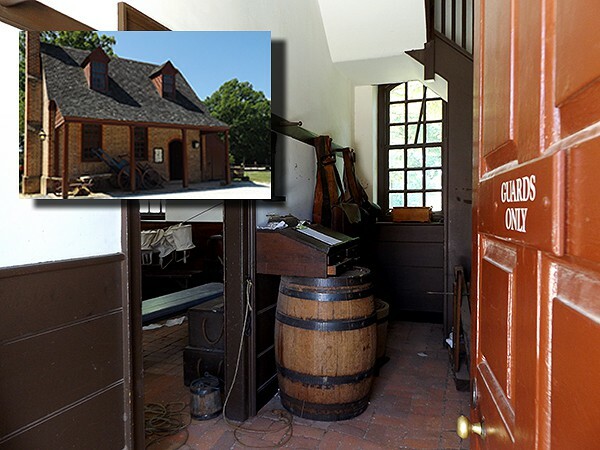 More than a month before our trip, I reached out to the Williamsburg Convention and Visitors Bureau via email asking for information about the must-see locations in the area so that I could plan an itinerary to fit our time there. All I wanted or asked for was information. At that point our flight and hotel arrangements were already made. I actually received a phone call the following day from a gentleman who proceeded to berate me for asking for “freebies” stating that they get over 150 requests for “handouts” to bloggers every day. I had not and would not ask for anything free! Never have and never will. However, this gentleman had the definite impression that all bloggers are greedy, grasping people who expect to be given hotel accommodations and venue tickets for free in exchange for a blog post. After I exchanged words with him for a few minutes, he did change his attitude and we had a discussion about several unique things to see in the triangle area. He also promised to send me some printed material (which never arrived) about them. I have to say that if we had not already planned our trip and had our flights arranged, we would have gone elsewhere for our weekend. I just wanted to put these comments here so that other bloggers might benefit from my experience. So glad you had a great time. Monticello is wonderful. I loved how the docents all speak of “Mr. Jefferson” as if he is out tending to business and expected back at any time. They do! It’s as though each of them know him personally. Our docent was a retired professor of history from UVa and our tour group included several history students. They could not stump him with any of their questions!